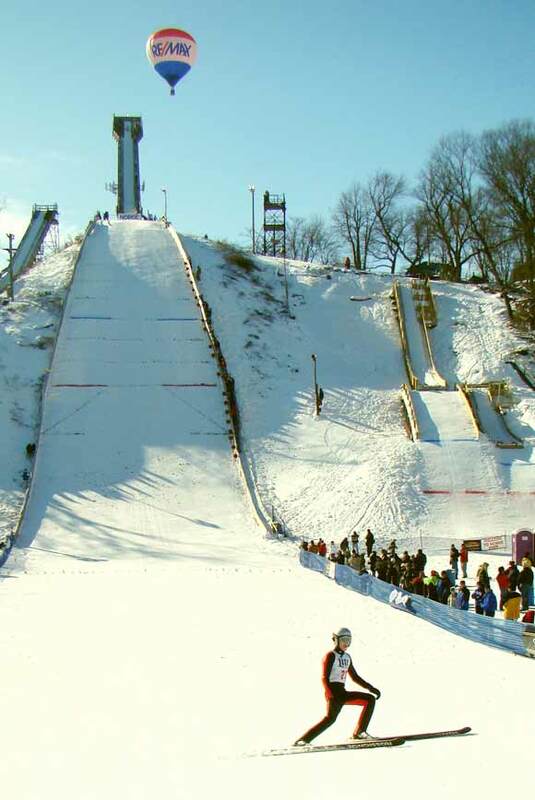 With one of the best junior ski jump programs anywhere, Norge Ski Club in Fox River Grove is a training ground for Olympic hopefuls of this extreme sport, and its 200-foot (70-meter) hill, refurbished in 2005, is regarded as the best of its size in the country. But just what is it that drives a sane person to want to leap off the equivalent of a 20-story building? It’s the middle of the night, and you’re fast asleep. Wandering through dreamland, you find yourself atop a 20-story building. It’s cold, and the wind is rushing. You’re frightened at this teetering height, but it’s exhilarating, too. As you look down at the ground, you suddenly feel an urge to jump. After all, it’s just a dream, right? Suddenly, thousands of people appear at the bottom, looking at you, cheering you on to jump. The voice of reason is buried by a rush of fear, audacity, fascination and doubt. You feel a tinge of déjà vu. The moment has come. You can do this. The cheers get louder. This is it – you’re going to fly! You slide down the ramp and fly through the air like few humans can. You feel a rush of adrenaline, and before you know it, it’s over; you land safely. You wake from your dream exhilarated. But it was just a dream. For some people, it’s not a dream. It’s a real sport called ski jumping, and people actually jump from that height and much, much higher. What makes a person think he or she can defy gravity this way, do something as unnatural as taking a flying leap from an incredible height that is known to hurt and even kill people? He’s referring to a 70-meter jump at the Norge (pronounced NOR-guee) Ski Club in Fox River Grove, and the testing he did at the tender age of 5 was on a much smaller hill. But what’s a ski jump doing in the Chicago suburbs? 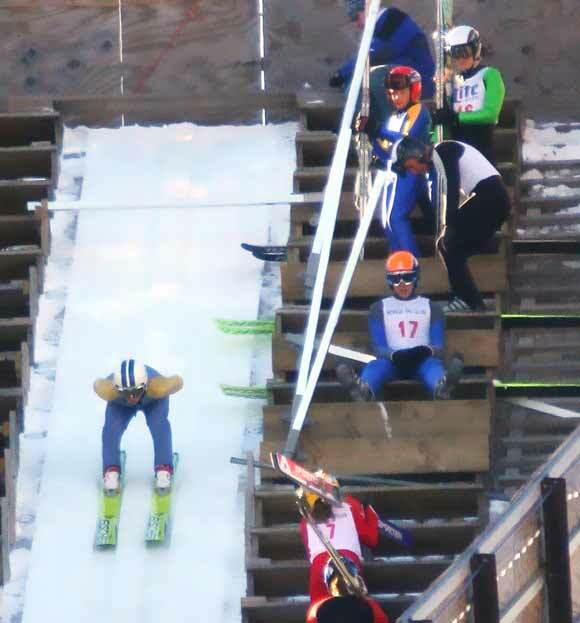 Norwegians are normally credited with starting this sport, sometimes referred to as “the original extreme sport,” and while it may seem that a ski jump is more suited to regions further north, or locales such as Park City, Utah, and Lake Placid, N.Y., it’s actually a very logical place. In 1905, a group of Norwegian immigrants in Chicago set out to find a suitable place for their favorite sport. They happened upon it in Fox River Grove, along the Fox River, reputed to be the highest point in McHenry County. They built cottages on the grounds to stay in while building the jumps, and today, Norge is considered the oldest continuously-open ski club in the United States. 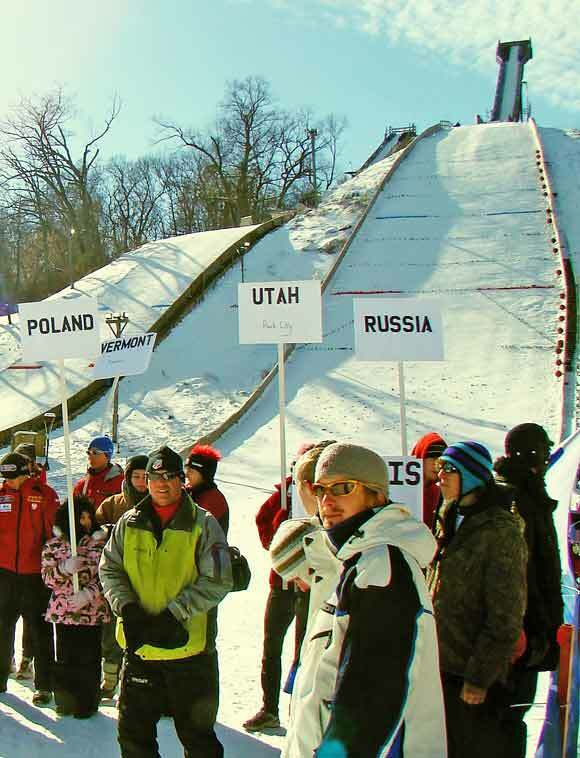 Stacked up against other ski clubs around the country, even the world, Norge Ski Jump is still among the smallest, though its size of more than 200 feet, or 70 meters, seems impressive to Midwesterners. “You rarely train on the Norge size,” Glasder says. “We usually train on 90- and 120-meter jumps. All the jumps in Europe are 90 and 120 meters.” But Norge Ski Club has things going for it that others don’t. 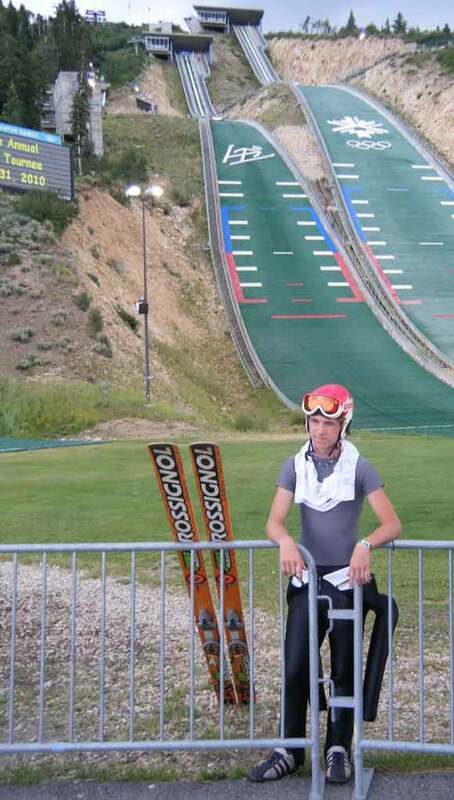 Gene Brown, current president of Norge Ski Club, boasts the lean, muscular build of a ski jumper. Though he’s never jumped, this Olympic sport has always been his favorite to watch. When his own son, A.J., began jumping at age 3, Brown was drawn into his son’s new interest. Central to the junior program at Norge are the ski jumps. There are five of them of various sizes for training: 5, 10, 25 and 40 meters, and the ultimate, the “K70,” regarded as the best 70-meter hill in the country. Refurbished in 2005, it’s the one that draws the crowds. 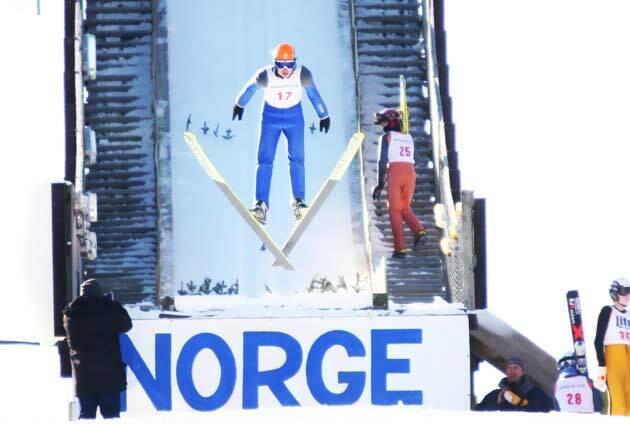 Brown encourages people who have seen ski jumping only on television to see it in person at Norge. “It’s so three-dimensional when it’s live,” he says. “You’re so close, and it’s so gravity-defying. When the skiers come off the jump, you can hear the wind come off their body. Think of when you put your hand out the window when the car is going about 50 miles per hour. With the larger jumps, it’s more, maybe 55 or 60 miles per hour.” Another factor that can’t be appreciated on television is the crowd. If there’s any doubt about how high it feels at the top, Norge Ski Club’s publicity chairman, Charlie Sedivec, dispels it. “You can see the Chicago skyline from the top, as well as the ski area in Wilmot, Wis., at night,” he says. Sedivec has been publicity chairman for Norge for 40 years. 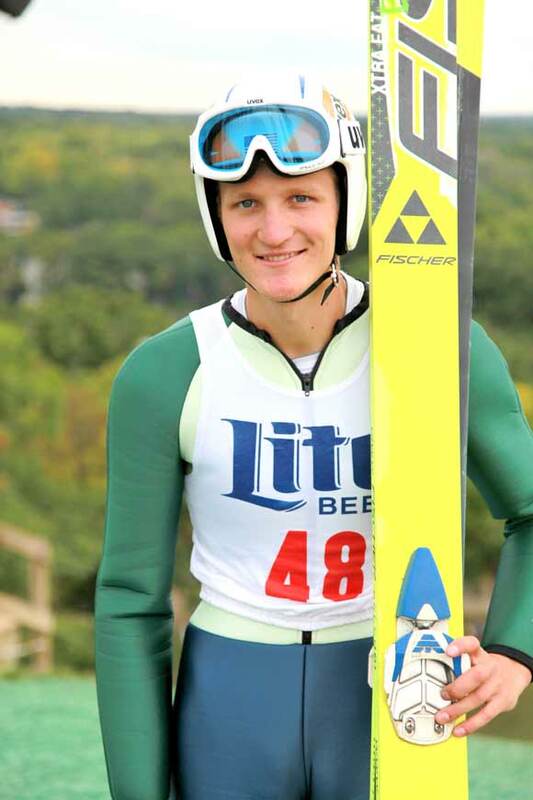 He got his start in ski jumping when he was 4 years old, continuing until he was a junior skier, when he switched to alpine freestyle and competed nationally. He laments the ubiquitous “agony of defeat” scene repeatedly watched by viewers of ABC’s “Wide World of Sports” that has beleaguered the sport of ski jumping for decades. “It exists even to this day,” he says. Some relief from this negative image appeared in 1988, at the winter Olympic games in Calgary, with Great Britain’s first-ever ski jumping competitor, the questionably talented and unquestionable character, Eddie “the Eagle” Edwards. Although he was regarded as an unskilled jumper, or perhaps because of it, the media spotlight shined brightly on Eddie, whose fearless attitude and everyday Joe persona enchanted both the public and the media. His ski jump performances were so bad, “it was as if he had an anchor on his leg when he ski jumped,” recalls Sedivec. Michael Glasder, from Cary, has been flying from Norge’s ski jumps since his grandparents took him there as a youngster. 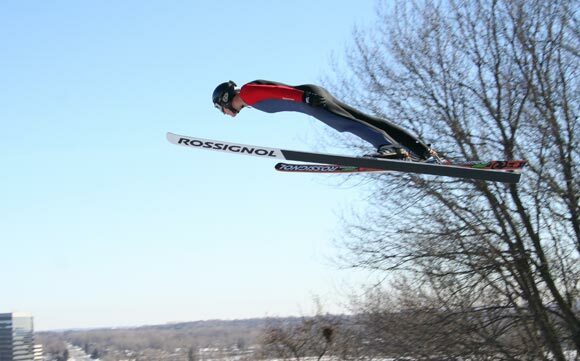 He’s now training to join the Olympic Ski Jump Team in 2014, when the winter games head to Sochi, Russia. When Eddie the Eagle was asked why he had become so popular when he was such a bad jumper, he responded: “There are a lot of good jumpers out there, but they’re very boring. So that part, getting everyone’s attention – that was easy.” This helps to explain how a guy who basically took last place in his event appeared on “The Tonight Show” and on the cover of Sports Illustrated. “I think what my Olympic participation shows is that you don’t have to be the best in the world to be popular,” he said. Eddie’s popularity continues to this day, with Hollywood making a movie about him to be released in 2011, starring red-headed actor Rupert Grint, who plays Ron Weasley in the Harry Potter films. Sedivec understood and appreciated the value of Eddie’s celebrity. Of all the crowds Sedivec has seen at Norge, the biggest came to see Eddie make a paid appearance there, just after he had sustained a ski jumping injury. The momentary respite provided by Eddie and his dubious image came back to haunt U.S. ski jumpers in a different way. As it turned out, Edwards’ less than stellar performance in the ’88 Winter Olympics was deemed a mockery of the sport by the powers that be, and subsequently, the rules for qualifying were changed. Now each country earns a certain number of Olympic qualifying slots based on World Cup Ski Jumping results. Teams from Finland and Norway may earn as many as six or seven spots. Other countries aren’t so lucky. For the 2010 Vancouver Olympics, Glasder was the fourth qualifier and missed the games by just a hair. A.J. Brown, at the Utah Olympic Park, in Park City, Utah, this past summer. Brown started jumping at Norge when he was only 3 years old. He’s now 15, and his father, Gene, serves as club president. Meanwhile, Glasder encourages people to come out and see the show at Norge, whether it’s a summertime jumping event on “plastic,” or the international showdowns in winter. Maybe one day, he’ll return an Olympic champion. Norge Ski Club hosts several competitions each year, including an international event in late January. For more information, go to www.norgeskiclub.com. This entry was posted on Thursday, January 20th, 2011 at 1:10 pm	and is filed under Features. You can follow any responses to this entry through the RSS 2.0 feed. Both comments and pings are currently closed.